This week, the Portland Trail Blazers released Greg Oden after a five-year, injury-tainted marriage that was star-crossed before he could show up for his first training camp. Oden is one of the most ill-fated athletes ever to appear on the cover of a video game, starring on the cover of College Hoops 2K8. It got me to thinking about other cover choices that either were ill-fated, or ended up that way—for athlete, or publisher, or both. This isn't the same as the "cover curse," associated most with the Madden franchise. That typically governs calamities that happen in the season in which the athlete appears on the cover. Nor is it the misfortune of being the last star of a canceled series. These are special circumstances, in which the context surrounding the appearance later darkens or makes a parody of what should be an honor for the athlete and the public face of a publisher's game. "Disaster" comes from latin, and its meaning is basically "ill-starred." Basically, things like earthquakes, fires and natural destruction are attributable to astrology. I'll use the classical definition of disaster here in talking about 10 star-crossed covers of sports video games released in North America. The story of NBA Elite 11, canceled a week before its release because of quality problems, is very well known. Some copies did make it out into the wild, with Kevin Durant of the Oklahoma City Thunder on its box. It can't be a happy memory for the three-time all star and two-time scoring champion. It'll be curious to see who EA Sports puts on the cover for its reborn NBA Live when it releases this October. Through no fault of his own, it would seem that Durant is damaged goods, as a make-good appearance here would remind everyone of the Elite disaster, or at least generate stories about it at a time when the label is trying to promote a new game. That's too bad. Durant's contract for this appearance was surely paid, but he deserved better. He found out the game was canceled over Twitter. Whatever Favre did to the nation in his inability to make up his bleeping mind, he did it first to EA Sports, not Ed Werder and ESPN. The label chose him to represent Madden NFL 09—the 20th anniversary edition of the game—clearly as a kind of lifetime-achievement honor. He had announced his retirement in March 2008; EA Sports unveiled its cover of Favre in a Packers uniform on the Madden cover in April. Then the circus came to town. Favre was traded to the Jets, and though EA Sports did release an alternate cover for fans to download, print and insert into the case, it sold the game with Favre as a Packer. The prospect of an athlete representing a former team apparently isn't bothersome to EA Sports. Brandon Marshall looks to advance to the main bracket of Madden's annual cover vote-off, representing the Dolphins. He was traded to the Bears this week. Why is this a disaster? Good Lord, look at that cover art. Drew Gooden's basketball success in spite of these deformities is inspiring, though. Harvin did not appear on the cover of NCAA Football 10. He was a candidate, though, and was even seen on the placeholder boxes for the game at GameStop. (This cover above is by an Operation Sports user.) Then he tested positive for marijuana at the 2009 NFL Scouting Combine, and EA Sports dropped him. NCAA Football 10 featured a different athlete for each platform. One of them, Utah quarterback Brian Johnson, ended up with the New York Sentinels of the United Football League and was released after two months. What should have been the charming story of Peyton Hillis, the everyman running back voted onto Madden NFL 12's cover, turned into a farce by year's end. Hillis bickered with Browns management over his contract, which was off-putting to Browns fans, who are noted for their loyalty. He sat out a game on the advice of his agent, which further soured their opinion of him, and last week he signed with the Kansas City Chiefs. He is the first Madden cover star to be traded in the offseason following his appearance.. He becomes the second athlete to change teams in the offseason immediately after his appearance, though Favre's switch to the Vikings involved retirement and a return late in training camp. Durant is the face of an aborted game, but Lincecum is the rep for one that should have been shitcanned. The ugly, glitch-filled MLB 2K9 is widely reviled as the worst sports video game of the current console generation. It was built on a nine-months production schedule when 2K Sports shuttered Kush Games and sent the project north to Visual Concepts. The damage done by this release can still be felt today. While the series was able to develop enjoyable pitching controls, every glitch seen in three games since stirs memories of this shocking failure. I wonder if Lincecum knows he's so closely tied with video gaming infamy. I don't know if I'd have the nerve to ask him in person. The Arena Football League enjoyed the you've-arrived moment of a simulation-quality video game when EA Sports chose to publish Arena Football in 2006 and then Arena Football: Road to Glory in 2007, which also included af2, the Arena Football minor league. Problem is, it was a previous-console generation game at a time when the new hardware was debuting. 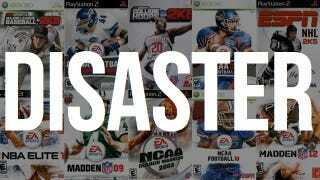 EA Sports walked away from the project in November 2008. The next month, the league and its players association suspended all of the next season, citing extreme financial difficulties. Arena Football went into bankruptcy in 2009 and was reconstituted as a new league after a public auction of all of its assets. It's still hanging on today, but appears unlikely to be an attractive video game license again. Both these guys were 30-goal scorers in the 2003-2004 season, and fine choices for NHL 2005 and NHL 2K5's covers respectively. Why is this a disaster? Because no NHL games were played in this season. Both men played in Europe as the league and its union bickered and ultimately wiped out the entire 2004-2005 season. It was the first time since 1919 that the Stanley Cup was not awarded. College Hoops 2K8 was a great game and Oden was a great college player. But after this game released, its career was over, and Oden's effectively ended soon after. Oden became a symbol of every professional franchise's worst fear: The No. 1 draft pick who turns up lame. He missed all of what should have been his debut season when he underwent knee surgery in September 2007. The following January, 2K Sports canceled College Hoops. He did play most of the 2008-2009 season, but he got hurt—again his knee— in November 2009, and a year later, knee surgery again wiped out his entire season. There is no college basketball title currently published for video game consoles, though College Hoops 2K8 lives on thanks to continued online support by 2K Sports and a community of dedicated roster editors and raters. But the combination of this title and its star make it one of the great what-if tragedies in sports video gaming. NCAA Football's cover really suffered in the latter part of the last decade, putting only one reigning Heisman Trophy winner on the cover from 2005 to 2009. Zabransky was the Peyton Hillis of this game, chosen mostly because his Boise State Broncos won one of college football's most thrilling games the previous January. Zabransky became the first NCAA Football cover star to go undrafted by the NFL in his appearance year. (Nebraska's Tommie Frazier starred on the cover when the series was called College Football USA). Zabransky signed two contracts but never played a down in the NFL.